Modestly funny but ultimately underwritten rom-com slash satire from the writer and director behind CALENDAR GIRLS. The deliciously brilliant Lucy Punch (YOU WILL MEET A TALL DARK STRANGER) plays former wild child turned demure nouveau riche bride Saskia. In the weeks before her ludicrously over-the-top wedding, she revolts against her spineless fiance Tim (Robert Webb) and becomes attracted to his boorish brother and best man Raif (Rufus Hound). Naturally, their indiscretions are caught in his amateur video of the build-up to the big day leading to entirely predictable last minute shenanigans. This clichéd is hard to buy in to because the characters are so under-written and one-dimensional. It's hard to see why Saskia would be attracted to either brother, and the promised revelations of her teenage rebellion seem rather tame. The social satire on competitive mothers-of-the-bride is far more successful and it's Harriet Walter as Saskia's mother who steals the show. The observational comedy is just absolutely spot on and authentic - from the mother gloating over her friends when she's secured the perfect venue - to the more extreme but subtly done idea that the bride will arrive on a fake unicorn. Ultimately, this already short film feels like it has a superb half hour television social satire hidden inside it and frankly, the production values don't lend themselves to the big screen either. 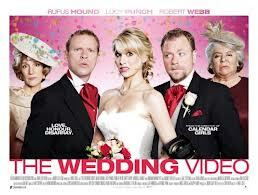 THE WEDDING VIDEO is on release in the UK, Sweden and Ireland.